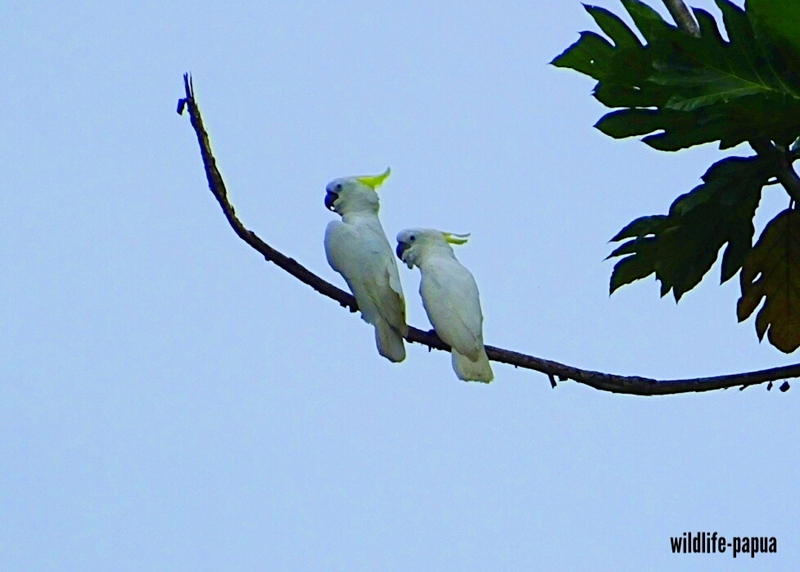 Sulphur Crested Cockatoo (Cacatua galerita) lives in Australia, New Guina and a lot of small islands in the Pacific region. 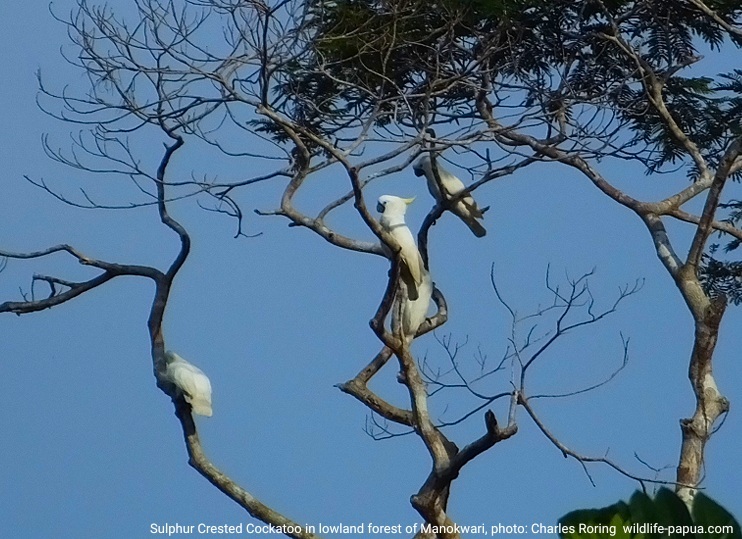 I often see the birds when I guide tourists on a hiking, camping and birding trip in lowland forest of Manokwari. They make nosy screeching sounds in the forest if they play together in a tree. 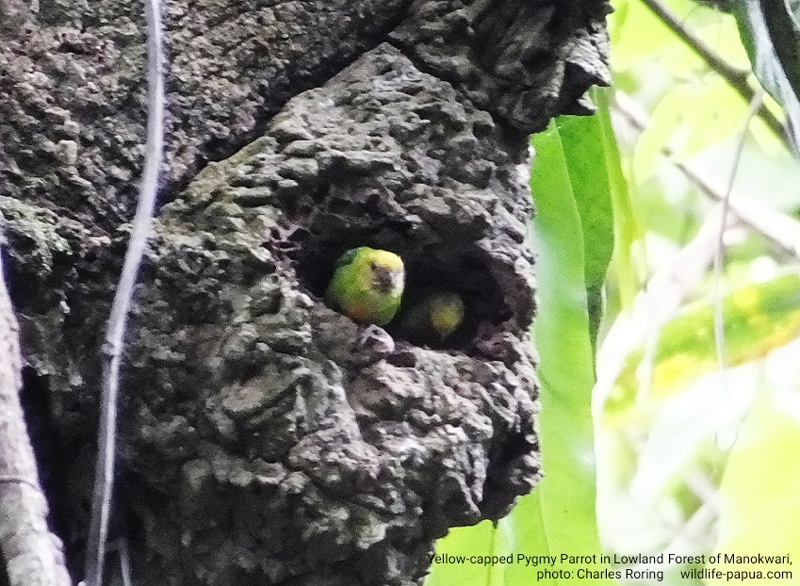 Cockatoes create nests by making holes in large trees high above the ground. To watch these birds, we need to bring binoculars such as the 10x42 or 12x50 mm and if possible a good spotting scope. Sulphur Crested Cockatoo eats tropical fruits including papaya, banana, and other fruits in the jungle. They play great roles in spreading the seeds of fruits which they eat to all parts of the forest. I have organized a lot of birding tours for European, American and Australian visitors to the forest of Manokwari where visitors could watch various species of birds including Yellow Faced Myna, Golden Myna, Lowlsnd Peltop, and Rufous-bellied Kookaburra, Eclectus parrot, Little-ringed Plover, and Little Egret, Brahminy Kite and Variable Goshawk, and Palm Cockatoo, Moustached Treeswift. There are other animals too such as beetles and butterflies, fruit bats, soa-soa lizard, snake, deer and forest pigs. A hiking, camping, birding and wildlife watching tour usually lasts for 3 to 5 days. 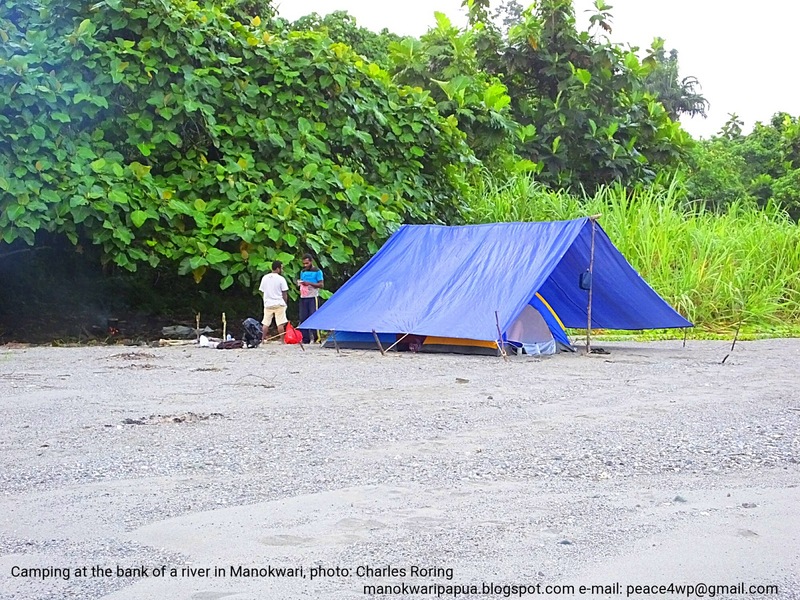 Since there is no guesthouse in the forest, tourists will stay in tents by the river. As a tourist guide, I can provide tents, matrasses, sleeping bags, cooking and eating utensils so that visitors do not have to carry heavy things from their country. However, I highly suggest that visitors bring flashlight/ torch, a good pair of binoculars and birding guide book Birds of New Guinea written by Thane K. Pratt and Bruce Beehler. Don't forget to put your electronics inside ziploc bags or plastic containers when you go with me to the river area. If you are interested in taking a birding tour in lowland forest of Manokwari, please, contact me (Charles Roring) by email to: peace4wp@gmail.com or send whatsapp/ text message to: +6281332245180. 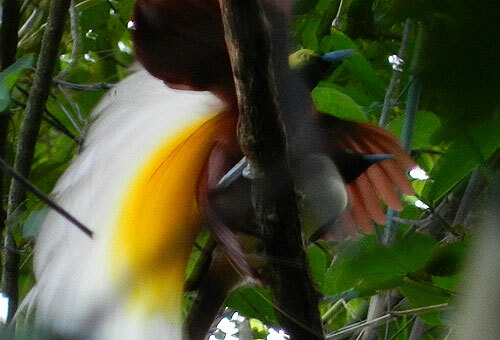 I often receive request from tourists who are interested in birding in Manokwari. There are several places in the regency that are good for birdwatching and wildlife watching. I highly recommend 2 places, the Lowland Forest of Manokwari and the Lower Montane Forest of Arfak mountains. There is a forest area in north-west region of Manokwari. Its name is Mesirrokow. It is a good site for visitors who want to watch such birds as Sulphur Crested Cockatoo, (Cacatua galerita), Moluccan King Parrot, Eclectus Parrot (Eclectus roratus), Palm Cockatoo (Probosciger aterrimus), Pequet (Vulturine) Parrot (Psittrichas fulgidus), Yellow Faced Myna, Rainbow Bee-eater, Dollarbird, Little-ringed Plover, Willie Wagtail, Large tail Nightjar, Brahminy Kite, Variable Goshawk, and a lot more. The river is also the natural habitat of a lot of species of butterflies, beetles, lizards, cuscus possum, deer, wildpigs and wallaby. 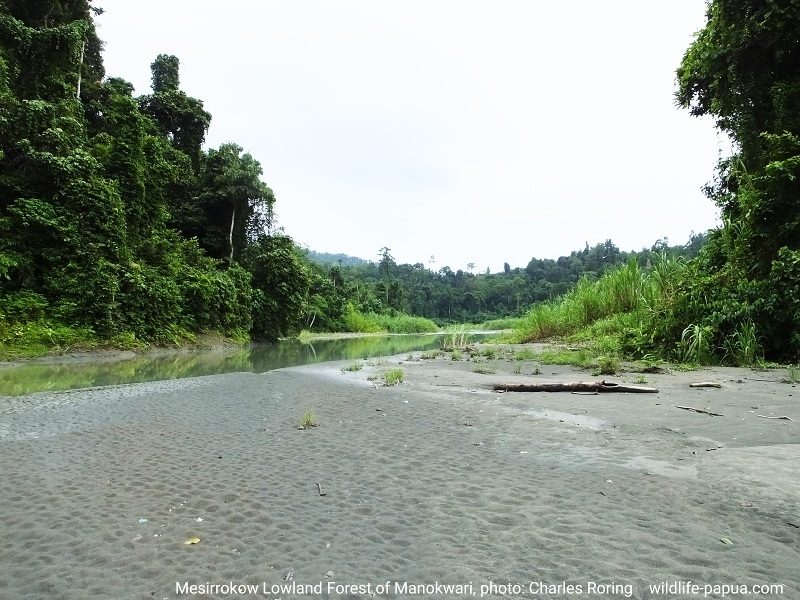 The Mesirrokow forest is devided by a large river that flows to north coast of Manokwari. Various kinds of flowers can be seen growing on both sides of the river. Since the birding site is located in the middle of the jungle, there is no guesthouse or homestay that are available at the moment. Visitors who go there will have to stay in tents. As a tourist guide, I can provide tents for visitors who want to take birding tour in this lowland forest of Manokwari. The slopes and ravines of Arfak mountains have been famous as birding and wildlife watching destination since long time ago. 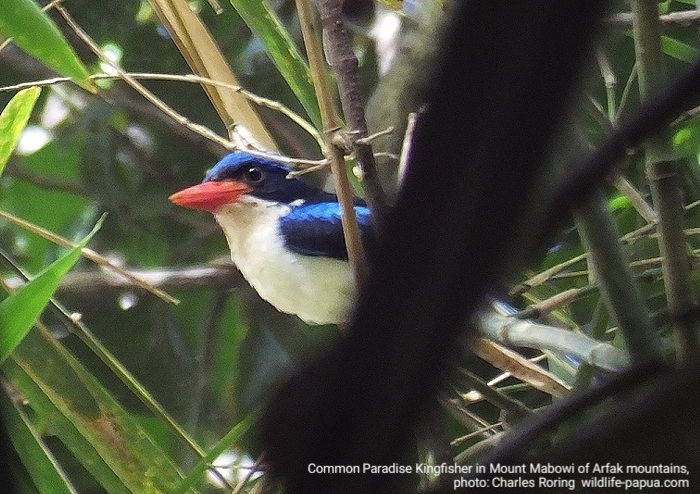 As a tour guide, I often organize hiking and birding tours to Mount Mabowi in Arfak mountains for people who are interested in watching cuscus possum, Lesser Birds of Paradise, Magnificent Riflebird, Magnificent Bird of Paradise, Common Paradise Kingfisher, Hooded Butcherbird, Sulphur Crested Cockatoo, Dwarf Cassowary, Papuan Frogmouth, and etc. In addition to watching birds, visitors who go hiking in Mount Mabowi will be able to watch cuscus possum, soa-soa dragon lizard, birdwing butterflies, and fireflies. The rich ecosystem of tropical rainforest in the region is a nice site for those who want to experience hiking, camping, and wildlife watching in Arfak mountains. Field guide book "Birds of New Guinea" written by Thane K. Pratt, Bruce Beehler and etc. You could fly from your country to Denpasar city in Bali island. Take a domestic flight to Manokwari city for birding and wildlife watching trip in lowland forest and Arfak mountains.